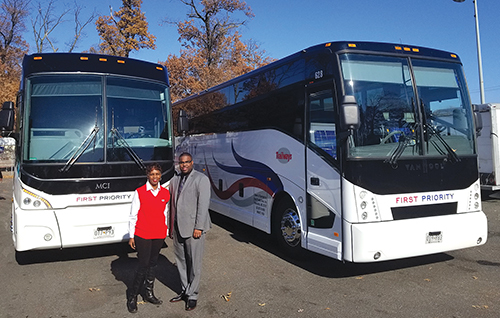 First Priority Trailways, based in Forestville, MD, opened in 1999 with a single motorcoach. Now, their fleet has grown to include as many as 25 coaches in the 18 years since. 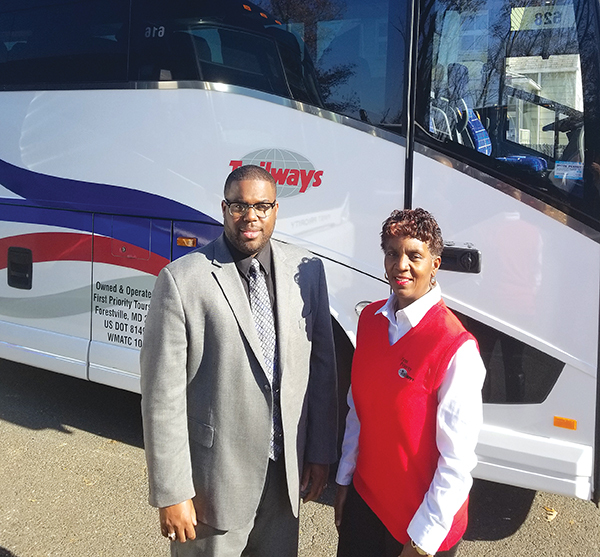 The company, founded by President Marcia Milton, runs charters for all manner of clientele – student groups, athletics, government contractors and employees – and has participated as an official transportation provider of every presidential inauguration since 2000. The company has also provided buses twice to the Democratic National Convention, as well as to the memorial services of Ronald Reagan and Ted Kennedy. 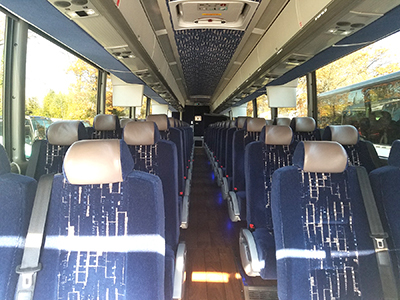 As a motorcoach business involved in such high-profile operations, it is imperative that First Priority Trailways’ passengers feel a sense of accommodation when they step on a bus. To that end, the company provides free Wi-Fi and onboard entertainment for all its passengers, their safety ensured by state-of-the-art fleet management and electronic driver logging. Milton says that an accommodating atmosphere has always been something on which First Priority Trailways prides itself, but managing the logistics was becoming a bit of a problem. First Priority Trailways began a bidding process in hopes of finding a single vendor for all of the aforementioned solutions. Milton says the company ranked vendors based on reliability, price and responsiveness. Ultimately, they settled on a local option – United Bus Technology (UBT) from nearby McLean, VA.
UBT’s flagship product, the NetBox. UBT allowed First Priority Trailways to pilot their products, followed by a 30-day free trial. At the end of the test period, Milton informed Wilson that she would like a proposal for UBT to enter into agreement with First Priority. The agreement would allow First Priority Trailways to cancel the partnership at any point if they were to be displeased with UBT’s service, as UBT does not lock partners into any type of restrictive contracts. • Mega WiFi provides unlimited 4G LTE Wi-Fi through T-Mobile, capable of serving more than 70 passengers at a time. • OnCoach CINEMA® is a proprietary software and hardware that allows First Priority Trailways to offer onboard movies which passengers can watch from their own personal device, whether that’s a cellphone, laptop or tablet. It offers a library of televisions shows, 25 premium movies and other non-premium content. It also allows First Priority to have a customized, branded movie player application. • MegaTrac is UBT’s own fleet management system designed specifically for motorcoach operators. It provides GPS tracking, fuel reports, scheduling, dispatch and driver communication. 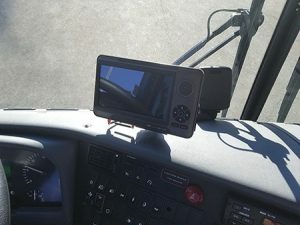 “With today’s regulations and stringent safety standards, it has become imperative for carriers to track their fleet, so they know exactly what’s going on everywhere, in real time,” Wilson says. 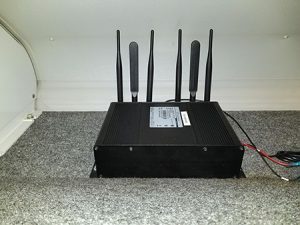 Wilson says that First Priority opted for self-installation of the NetBox, and that the contract-to-installation period wrapped in just over three weeks. UBT staff conducted training on the Wi-Fi, entertainment and fleet management with First Priority Trailways’ administrative staff, who then trained the drivers. The drivers, in turn, will train charter passengers to use the system as they begin a trip. First Priority Trailways and UBT are handling ELD training in a second phase. Wilson trained the company’s fleet manager, who will then manage the drivers and audit the electronic logs. UBT’s product manager conducted company-wide log training for drivers. Milton says the drivers have praised the new system’s ease of use, as well as the support network associated with it. Passengers, Milton says, are thrilled with the prospect of downloading their own entertainment – whether that’s movies, eBooks, online news or even just their emails. “The options are what’s important,” she says. She says she expects overall safety to increase exponentially as the ELD program ramps up. Drivers are, as the mandate specifies, more cognizant of their hourly driving as well as the time it will take them to get home. Milton says she is confident that First Priority Trailways is at the forefront of providing quality service to charter passengers.